That’s Hank, and that’s Normal Heights and how I remember it — or certainly part of it. But someone did intervene for me in Normal Heights once, though I wasnt under attack from other people. I was out walking our dog, Alex, a rambunctious, 75-pound pit bull/German shepherd/Lab mix. Rambunctious is being generous. Mostly, she was out of control and required a steel-toothed choke collar on her walks (which in retrospect, with the help of many guilt-inducing programs on Animal Planet, I realize wasn’t helping). That day we were walking south on Mansfield, north of Adams, when I saw at the end of the block a loose pit bull, a real pit bull, not a hybrid mixed nut like ours. A big brindle pit, with dangling testicles the size of grade-A jumbo eggs. He had one of those intimidating giant heads that looked like a blacksmith could use it for an anvil. This was a hard, mean dog, I could tell right away. I froze. So did the pit. Our eyes locked. Alex was too busy smelling a pile of crap on a lawn to notice the other dog yet. I thought about walking away hurriedly, before she could see the pit, but I was afraid the other dog would run up behind us if I turned my back. Then my savior intervened. Alex now saw the pit and tried to run at the dog, the steel-toothed collar biting into her neck and holding her back. But she didnt let up; it was like trying to restrain a horse. The pit flinched, looked ready to charge toward us. Alex reared up again. He armed himself with his lumber and escorted us to the end of the block, walking backward. I practically had to drag my wired and wild dog. Our bodyguard slapped the axe handle against his palm, as the pit followed us at a steadily decreasing distance. We made it to the corner, and I thanked him. He turned and ran at the pit bull, cursing at him to go home, swinging his axe handle like a madman. And the pit ran away, tail between its legs, out of sight. So Good Samaritans do exist, Hank. You’ve been one to me. Hell, even I was a Good Samaritan more than once in Normal Heights. Just ask Ted the Peanut Man, if he’s still with us. My wife and I refer to him as the Peanut Man because it was ten pounds of the nuts in his overstuffed backpack that brought him down one afternoon. Left him on his peanut-bulging spine, helpless as a flipped turtle, in the middle of our neighbor’s yard. Everyone who lived on that stretch of 34th Street, between Meade and Monroe, was used to finding things on their lawn — condoms from hookers and their tricks, malt-liquor bottles, garbage, dog sh*t, weeds. But finding an actual person stranded on his back was a new one. Always a new one in Normal Heights, you could count on that. According to my elderly neighbor Vic, who witnessed it from a seat on his porch, this gentleman was walking slowly and unsteadily when the weight of his backpack proved too much. He staggered a bit, then fell back onto the lawn. From the ground, Ted meekly lifted a hand in joking acknowledgment: that’s me. He looked to be in his 50s but was probably younger, very pale, his complexion dry and blistered, and he was thin, emaciated really, in a way that suggested a wasting disease. AIDS came to mind. I removed the backpack from around his shoulders. I paused, trying not to laugh. “How far do you still have to go?” I asked. “And you’re really walking the whole way?” This guy looked in no shape to walk more than a block or two, much less several miles with a half-ton of goobers weighing him down. “I thought I could make it. I really love peanuts.” He said this last line as if knowing how ridiculous it sounded. I knew what he meant, having taken the bus a lot as a kid. Sometimes, it was quicker going 12 miles than 2, depending on the routes. I offered to give him a ride home, which he accepted with a thank you. In the car, his breathing seemed to steady and calm. We chatted a bit, mostly about how the sale was too good to pass up; it was enough peanuts for more than a month, at a fraction of the cost. And he really believed he could make it. I liked Ted and wanted to tell him to call me whenever he needed a ride, but just then we pulled into the parking lot of a dirty-stucco 1960s North Park apartment complex (Three Palms, Palm Gardens, Palmolive, something with a palm in the name). As I came to a stop, I noticed four or five tough-looking young black guys working on a couple of cars. Now, I’m a good liberal, I even have blood relatives who are black, but these guys were daunting, tall and ripped, with (whether they knew it or not) strangely cold expressions. “Pants on the ground” and angry times ten, or so it seemed. Two of them wore blue bandannas, which my honky instinct immediately associated with the Crips. In other words, I was a scared little white boy. Ted’s apartment was on the third floor, and I knew I’d have to help him up the stairs, but for a moment, I was afraid to get out of the car. At that point, the crew working on their cars realized who my passenger was, and they approached, smiling and waving, looking relieved to see him. He opened the door, but the biggest guy in the crew, who had some seriously tight cornrows, jumped to help him out. “We don’t wanna lose you,” said another. The big guy walked around and shook my hand through the now-open window. I introduced myself and told him the story of how Ted ended up on Vic’s lawn. Andre responded with a chuckle, both amused and unsurprised, then walked away to affectionately chide Ted, their beloved Mr. T. Andre and his friends helped Ted up the stairs to his top-floor apartment. It would be a long, slow, joyful climb. Shortly before we moved out of Normal Heights, I was rudely awakened at dawn, barely dawn, by mariachi music so blaringly loud I could not understand how it could be real, so loud I couldn’t hear my wife next to me in bed asking…something. I didn’t know whose stereo was blasting it, or how any stereo could, but I was going to find out. I put on robe and shoes and walked out onto the empty street. How was nobody else out tracking the racket, the way I was? Helen Keller couldnt have slept through this. I looked around for any sign of where this seizure-grade fiesta of noise was coming from. Then, suddenly, the song ended. Out from a house across and up the street came an older Hispanic man, the father of the odd family who lived there. I say odd, because once he moved in with wife and two kids and grandma, he proceeded to build an addition onto the back of the house, and this addition looked like an airplane hangar. Shaped like a long box, it was easily twice the size of the original house. I could never figure out what they might be using it for or what was going on in there. “Excuse me, was that your music?” I asked politely. I wondered how Granny didn’t drop dead from a heart attack, being awakened like this. But Dad went back to the house and closed the door, and as he did, boom, the mariachi music started again, blaring a new tune. I stood there and thought about what he’d said. Don’t worry, they’re almost done. Sure enough, a few minutes later, the song ended. And like something out of Three Amigos — or a silent-movie comedy — the front door of the hangar-house opened and out rushed an entire ten-piece mariachi band in full dress, spangled sombreros as big as umbrellas, toting their shiny instruments. Within seconds, and with an almost choreographed precision, they all piled into a primer-gray van and drove away. Sputtered away, actually. And that was that. ¡Feliz cumpleaños, abuela! Unfriggingbelievable. Yes, there was always something new in Normal Heights. Only in Normal Heights. Keep your head up, Hank. May 12, 2010 @ 1:40 p.m. This story about an "evil" pitbull is BS! You cannot tell a dog is "evil" from a block away or even right in front of you unless you see his teeth bared or hear growling. You are merely assuming it is evil because it is a purebred pitbull. You are helping to give them the bad rap that they do not deserve. If the dog was evil, he would have attacked and not just stood his ground. He most likely followed because he wanted to meet other people/dogs and was lonely because he has a "worthless idiot" owner. I take it you're jealous of his size, too. Also, if he was "evil", he would have attacked he guy with the stick out of defense and not run with his tail between his legs. The guy in the tye-dye was not a good samaritan but only a cruel dog-hater! Lastly, your dog was the initial aggressor and the other chose not to engage. Another sign of a GOOD dog. I realize your dog has pit blood in him as well, but you seem to think that because he's mixed with other breeds, he's much better and superior. Quit attacking pit bulls!!! It's people like you that are making it harder to own pit bulls and other dogs with similar reputations. May 12, 2010 @ 2:19 p.m.
Oh this is such the life in the Heights . . . its why I love this neighborhood! May 12, 2010 @ 6:04 p.m.
As I've posted previously, I've worked with more than 500 pit bulls and own two. There are plenty of them I wouldn't want to have around, but not all of them are bad. My dogs are victims of pit bull prejudice every day and they are great dogs. The problem is that the general public doesn't know what to look for in terms of whether a dog is good or bad. I know that those of us who have been around them in shelters for years, tend to cringe when we see one on the loose. I do think that pit bull owners should be required to have their dogs temperament tested at their own expense. They should wear orange tags to give the public some assurance of safety--he's one of the good ones, guys. I think owners of strong breeds shopuld be held to a higher standard of care than other owners because of the potential damage they can inflict. Pit bull owners should pay a heavy fine if their dogs run at large--it's only fair. May 12, 2010 @ 8:22 p.m.
"Go home and show your parents the knot on your head and tell them it’s their fault! Come back, you forgot the bag!’"
Agree with everything in #3. "I think owners of strong breeds should be held to a higher standard of care than other owners because of the potential damage they can inflict." Absolutely. That breed's ability to cause permanent disfigurement and/or death is reportedly so far and above that of other dogs that they are in a class by themselves -- a deadly weapon with a bite more on the scale of an alligator or gila monster than a dog. They can rip skin and muscle right off, down to the bone. Yeah, apparently a thief. 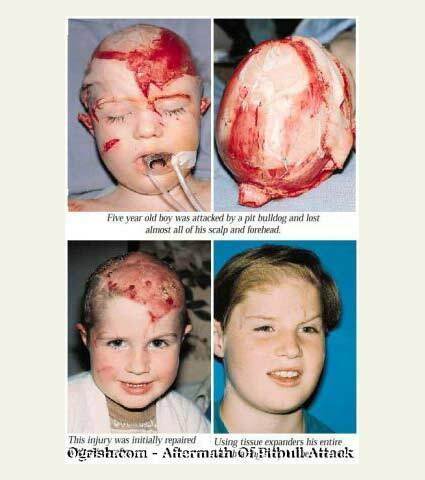 But what did these children do to deserve their pitbull maulings? What about Vico, the little pug that was killed this past Saturday, April 24 by a pit bull at the Grape St. Dog Park? This is what comes up when you put in keywords "pit bull injuries" on YouTube. Certainly plenty to watch. If you Google "pit bull attacks," you'll get approximately 2,840,000 hits. There's plenty of evidence as to how dangerous the breed is, and plenty of information about them on the internet. Most people who own them are simply ignorant, and there's a good chance that someone ELSE -- be it their child, another pet or a random stranger, may very well suffer for it. I remember a few years ago working with a young woman whose male friend had called her distraught, crying "My dog killed another dog!!!" Of course it was a pit bull. What else? May 13, 2010 @ 5:57 a.m.
May 13, 2010 @ 5:46 p.m.
First I’d like to start off by saying that I agree with the 3rd comment, however I feel that the person posting comment number 4 had two things going for them. 1. They have a skewed sense of reality when it comes to pit bulls, the breed and their responsible owners. (Note: I said RESPONSIBLE owners). 2. They have an amazing ability to utilize Google and You Tube to type in negative search words on pit bulls. So seeing as they seem to have one side I’m going to broaden your horizon. Are you ready girls and boys? I’m about to give you today’s lesson. That is 4th and 5th place out of 122 breeds. Evil dogs with a taste for blood from birth? I think not. Did you know that pit bulls are used as therapy dogs? Now why on earth would hospitals, senior homes and rehab centers use them if they are going to snap and turn on patients? Do you know what a nanny dog is? No? I didn’t think so. A "nanny dog" is the name given to pit bull terriers many, many years ago. Pit bulls were called nanny dogs because they were loyal, caring companions for children. We have forgotten that their history is of a loving, caring family pet. They were treated as a part of the family. They were loved and respected and they gave love and respect in return. Today’s' view of the pit-bull is very different. They are viewed as aggressive and dangerous animals and have been banned in many places. The pit bulls that are aggressive have been trained by their owners to be aggressive. Their nature is to love and to please the people that own them our society blames the pit bulls. The blame falls squarely on the shoulders of the owners that train them to fight and to be aggressive. Dogs do not train themselves, people train them. Michael Vicks' recent trial and conviction for dog fighting is a step in the right direction. He was held accountable for his actions and the abuse of the dogs in his care. Every person that conducts themselves in such a manner should be held accountable in the same manner the pit bulls should not be punished for their actions because of owners training them in inappropriate behaviors. Responsible dog ownership brings about very much different behavior in dogs .I hope that more people will remember pit bulls as nanny dogs in the future and give these dogs a chance to show their loving, caring nature. How can such an awful breed be so loving? Maybe it’s because it’s not pit-bull owners that are ignorant but people like you that enjoy the hype the media has branded them with. Pit bulls only account for 12 percent of dog attacks. May 13, 2010 @ 5:48 p.m.
BSL is an ethical failure. BSL is a public safety failure. Description Breed-specific legislation (BSL) bans or restricts certain types of dogs based on their appearance because they are perceived as “dangerous” breeds or types of dogs. A breed ban usually requires that all dogs of a certain appearance (“targeted breed”) be removed from the area wherein the BSL has been implemented. Breed-specific restrictions may require an owner of a targeted breed do any of the following or more, depending on how the law is written: • Muzzle the dog in public • Spay or neuter the dog • Contain the dog in a kennel with specific requirements (6′ chain link walls, lid, concrete floors, etc.) • Keep the dog on a leash of specific length or material • Purchase liability insurance of a certain amount • Place “vicious dog” signs on the outside of the residence where the dog lives • Make the dog wear a “vicious dog” tag or other identifying marker Breed-specific legislation applies only to dogs of a certain appearance, not to any and all dogs. It does not take into account how the owner has raised, trained, or managed the dog. It does not take into account the dog’s actual behavior. Why Is BSL Wrong? • BSL does not improve public safety or prevent dog bites. • BSL ignores the plight of victims and potential victims of non-targeted breeds. • BSL is costly. • BSL requires each and every dog to be identified as a breed—something that has proven impossible to do accurately and objectively. • BSL makes targeted breeds more desirable to irresponsible and criminal owners. • BSL does nothing to make irresponsible dog owners accountable. • BSL punishes responsible dog owners. • Not a single canine welfare organization supports BSL. In Denver they will come to your home and take your dog, sentence him to death and leave you, your family and heart empty. So…. If you aren’t convinced yet maybe the next time you get an itch to search Google try looking up how many lives pit bulls have saved. How many children they have kept safe. Or how about how pit bulls are used as rescue dogs? Drug dogs? Or even in the military? BAN THE DEED NOT THE BREED. Being the owner of a pit-bull comes with a HUGE RESPONSIBILITY. Next time you feel like attacking someone or something, in this case the pit-bull, get all of your facts the good and the bad, no breed of dog is perfect, nothing or no one is. That includes me and certainly YOU. Why did it get pulled? May 13, 2010 @ 7:44 p.m.
Pitbulldad is one of the reasons pit bulls have a bad rap. They are defensive to a fault and have tunnel vision when it comes to seeing what pit bulls are all about. They won't even acknowledge the risk. Yes, some pit bulls are dangerous. There are plenty of pit bulls at the shelter that I would not bring home. They challenge me, the leader, let alone other people and dogs. My two pit bulls will only kill you by loving you to death, but because there is such irresponsible backyard breeding and defensive owners, when these dogs are capable of chewing up aluminum cans as if they're plastic--people at the dog park nearly faint when we walk in. Many of them are dog aggressive and you only need to work at a shelter to find that out. If pit bull owners don't respect what some of the breed do and, responsible pit bull owners like me are going to continue to be looked at as if we're ignorant and own dangerous dogs without acknowledging it. May 13, 2010 @ 8:59 p.m.
My guess is that Pitbulldad's comment was removed because it was more of a personal attack on AG rather than a simple difference of opinion. All I know is that when you breed (and then inbreed) some animals for a specific aggresive purpose, you're bound to run into trouble. I can tell you that sometimes this happens in thoroughbred horses. For example, the horse Forty Niner would have been a great race horse, but he was incredibly aggresive, difficult to handle, and often downright mean. While he wasn't inbred any more than most thoroughbreds (4x4 to Nasrullah as are a lot of thoroughbreds), he was certainly bred to be aggresive. Proof of his greatness came in his prodgeny, which include notables such as End Sweep, Editor's Note, Gold Fever, Distorted Humor, Coronado's Quest, Ecton Park, Sunday Break, and on and on. While those horses didn't inherit their father's mean disposition, many others did - to the point where even after gelding, the colts were unraceable. Point is, I imagine that you can buy a pedigreed American Pit bull terrier pup from a good place, train it to be nice and give it some love, but there's no assurance that the breeding won't reveal itself and foil the theory that all a dog needs is a good home and everything will be fine. May 13, 2010 @ 9:10 p.m. I'm trying to remember when I've seen a story that was even the slightest negative on put bulls that didn't have the defenders leap to the defense of the breed. And those defenders claim that the breed isn't at all the sort of thing that its reputation indicates. Who is right? Who is wrong? It is very hard to be sure, but why are the preponderance of stories about dog maulings and killings about pit bulls? I'll prefer to avoid pit bulls along with Dobermans, Rottweilers, and wolf hybrids. Just to be safe. May 13, 2010 @ 9:30 p.m. There are only so many times you can read or hear how negatively people feel about your best friend and family member before you get frustrated to the point where you respond as such. I think that's what pitbulldad was doing. I do agree though that pit bull owners should be cautious as to how they defend their dogs with the knowledge that the breed and owners are looked down upon. You cant really honestly say he's an irresponsible owner, that comment comes from assuming how he handles his dog at home. im sure there are quite a few bad pit bull owners out there that seem to be calm and all sorts of polite. When in public with your dog be positive and not confronting. In short, be polite to rude people. If someone says, "Look at the killer dog with the idiot owner" don't strike out in anger, let it go and move on. Allowing people to get under your skin will only make you and your dog look negative to the public. Everyone is entitled to their own opinion, so with that said its people that shine a big spot light on the negative aspect of the dog are the ones that feed feed fuel to the fire and media hype on god awful things like bsl. right now they aren't coming for your dog, and because its not yours, most will stand by and do nothing, and when they come for your dog, your family member, your best friend and companion, you will wonder why no one is doing anything for you. May 13, 2010 @ 9:35 p.m.
pit bull Attack A man is taking a walk in Central park in New York. Suddenly he sees a little girl being attacked by a pit bull dog. He runs over and starts fighting with the dog. He succeeds in killing the dog and saving the girl's life. A policeman who was watching the scene walks over and says: "You are a hero," tomorrow you can read it in all the newspapers: "Brave New Yorker saves the life of little girl." The man says: "But I am not a New Yorker!" "Oh, then it will say in newspapers in the morning: Brave American saves life of little girl" - the policeman answers. "But I am not an American!" - says the man. "Oh, what are you then?" The man says: "I am a Saudi!" Then next day the newspapers say: "Islamic extremist kills innocent American dog." May 13, 2010 @ 9:38 p.m. HAHAHAHAHAHAHAHAHAHA!!!!!! did you figure it out yet? HAHAHAHAHA pitbulldad and i live in the same house, im the more calm educated one!!!! i totally posted the last two post under his account by ACCIDENT!!!! May 13, 2010 @ 9:45 p.m. Pit bull and pit bull mix breeds have been shown in study after study, in America, Canada, and the UK, to cause the highest number of fatalities in terms of dog attacks, anywhere from 30% to 60%. I don't care how you parse those numbers, clearly pit bulls are by far the dog breed most responsible for fatal attacks. No amount of responsible ownership and temperament testing will reliably predict if and when a pit bull will attack and kill. Further, law enforcement has long been of the opinion that pit bulls are the breed most used in criminal activities, anything from dog fights to guarding drug houses to gang intimidation. My own opinion is, even assuming the worst is not to be believed, with so many other fine breeds of dogs to choose from, why do people need pit bulls? As far as I can see, this is not a breed of dog the human race can't live without. And if their fanciers insist on the breed's continued existence then I think they should be made to pay an extremely high premium tax to keep them, made to attend paramedic courses, made to carry break sticks to pry their jaws open if necessary, made to carry special insurance, and agree to have their dogs taken away and euthanized if they are ever caught off leash, escape from their yards, or show any aggressive behavior whatsoever. May 13, 2010 @ 10:08 p.m.
Why is it that people walk around acting like pit bulls walk around in with premeditated murder on their minds? Pit bulls are not the leading dogs of fatal attacks, Rottweiler’s are with a percent of 67.
on average 3 people die every year by a pit-bull, when 3 children die every day by the hands of a parent. in 2009 there were 23 dog related fatalities so if only 3 were by pit bulls who committed the other 20? Ghost of pit-bull past? To say that “As far as I can see, this is not a breed of dog the human race can't live without.” is harsh, cold and distinctly malicious. My own opinion. Its racial profiling for dogs plain and simple. When BSL comes knocking at your door because there are no more pit bulls to come after and they come after your lab, or poodle or border collie because statics say they bite, what will you do then? May 13, 2010 @ 10:16 p.m. I do agree that upgrading the image of pit bull owners will help the breed. Cuudlefish is far off base in the above comment. Temperament testing and a good home do predict whether a dog will attack and kill--the problem is that not that many people are capable of figuring it out. I trust my pit bulls around all kids and adults, but not small animals. I open their jaws and pull out foil or paper. I shove pills down theeir throats and they never flinch. My other dogs are nervous (you never see nervous pitbulls) and make me nervous around other people. Pit bulls are the most beloved breed to those who aren't afraid of them because they were originally bred to be sweet and eager to please around people so they could be handled well in the pits, but aggressive with other dogs. Food and mating issues tend to start fights in any breed and must be supervised. But some pit bulls like Gus, haven't a mean bone in their body. They are great dogs and they should be around, but the ignorant stuff mentioned above isn't necessary. Pit Bulls latch on when they see something they preceive to be a bull's nose since they were used to hold bulls for slaughter. They don't just suddenly lash out, there are 8 types of aggression that cause them to attack. No need for a break stick. If at a dog Park, carry Q-tip swabs and stick them up the nose of the dog that latches on. Can't continue to latch on if you have to open your mouth to breath. There a great pet if you know what you're doing. May 13, 2010 @ 10:19 p.m.
Visduh, I'm with you, there are certain breeds I'm not all that comfortable with. If other people want to own 'em and defend 'em, great, but those four breeds would be on my list as well. Same with a horse, I wouldn't buy a thoroughbred and expect it to be a nice stablehorse I could ride around the ranch on the weekends. Although, some horsemen do that and it seems to work out just fine for them. May 13, 2010 @ 11:03 p.m.
"No need for a break stick. If at a dog Park, carry Q-tip swabs and stick them up the nose of the dog that latches on. Can't continue to latch on if you have to open your mouth to breath." And I certainly wasn't putting you in the "ignorant" owner category. If anything, I'd say you're closer to an expert. I skimmed PitBullDad's comments, and they're typical. I notice that the defenders like to cite statistics out of thin air that appear favorable to the breed, but seldom (as in NEVER) cite their sources. As for my coworker who's pregnant with her second baby and just acquired her second pit bull? She's responded to my providing her with the story of the 2 pits attacking the baby and tearing off his testicles, and numerous other articles concerning pits attacking small children -- by putting up pictures of her dogs at her station. This little genius has already lost one baby boy (due to no fault of her own). One would think she'd have better sense. If/when one of those dogs tears up one of her kids (4 year old girl, infant on the way), as far as I'm concerned, it is 100% her fault and she should have her kids taken away from her for being a moron. Another of my coworkers described a recent attempt to walk her small dog through her neighborhood. She noted they were being watched by a pit bull that began following them. As she sped up, so did the pit. She scooped up her little dog and ran, jumping down into a ditch and up the other side. The pit didn't follow, but just stood there. It never made a sound. She looked at him and noted that he was all bristled up. Was reading on a blog the other day in which the poster was afraid that her pit bull puppy was going to kill her cat. The behavior was that the pit would chase the cat, corner it, then hover over it and lick the back of its neck. shudder About half a dozen responses in a row said either, "My dog killed my cat," or "Your dog WILL kill your cat." This was still just a pup. Certainly not "trained" to be aggressive. With an endless amount of pit bull attacks to read about on the internet, as well as REAL statistics at places like DogBiteLaw.com (see link above), there's not much sense arguing. The most dangerous breed. Period. May 13, 2010 @ 11:50 p.m.
Actually pit bulls were chosen and bred specifically for their fighting tendencies. Originally they were bull baiters, which is where the bull part of the name pit bull comes from, then they were bred for dog fighting. Everything about their nature, therefore, is about violence and maiming and killing other animals, and let's face it coldly, a dog can't distinguish one animal species from another, a cat from a baby. The tendency of the human heart is to wish to believe that dogs are companionable creatures. They are in fact animals, with all that implies. May 14, 2010 @ 12:11 a.m.
"Bulldogs were used for all manner of work, including baiting, fighting, stock work, hunting, and farm dog, as well as companion animal. They were an agreeable dog, capable of extreme ferociousness towards other animals but unwavering loyalty and gentleness towards humans. They were a breed which was required to demonstrate a certain level of animal-directed aggression, but were routinely used in pairs to bait animals and hunt, so overt aggression towards others of their same species was not an extreme trait. In 1835, a law was set in motion in England that would make the sport of baiting illegal, and over the next few years, the activity eventually died down upon enforcement of the law"
"A 1997 study of dog bite fatalities in the years 1979 through 1996 revealed that the following breeds had killed one or more persons: pit bulls, Rottweilers, German shepherds, huskies, Alaskan malamutes, Doberman pinschers, chows, Great Danes, St. Bernards and Akitas. (Dog Bite Related Fatalities," Morbidity and Mortality Weekly Report, May 30, 1997, Vol. 46, No. 21, pp. 463 et. seq.) Since 1975, fatal attacks have been attributed to dogs from at least 30 breeds. Have you read dogbitelaw.com? it never states that pitbulls alone are "The most dangerous breed. Period" they have their down falls and upsides, everything does. every DOG does. But! on a lighter note you are right about one thing, there is no sense in arguing, and as far as im concerend i wasnt, i was engaging in a semi intellegent debate. once people have made up their minds about something i dont find it likely they will change their mind via web posts. =) have a good night, it was fun while it lasted. May 14, 2010 @ 9:57 a.m.
"Have you read dogbitelaw.com?" Some of it. But you obviously have not. I think that's good enough. I'm not going to go back & find the PDF document that lists pit bull attacks in the 4-digit range, while the very worst of all the other breeds barely reach into the hundreds. 65% of fatalities, which means that ALL OTHER BREEDS COMBINED only make up the remaining 35%. Just about two thirds. Pretty impressive. This woman survived. Lucky for her. The one above is the most harrowing, to me. Totally unprovoked, by a dog they'd owned "since Scott was a baby." His mother's plea: "Learn from a grieving parent...get rid of the dogs." May 14, 2010 @ 11:45 a.m.
What on earth did I start? The dog I ran across -- off a leash and escaped from its yard, and glaringly un-neutered -- would've struck almost ANYone with a fright. My dog, I fully admit, was hyper to start with, but she was also a SHE. And unfixed male dogs, I'm sorry, especially dogs larger than she was, and not with their owner, please, it's not exactly a recipe for canine peace and harmony. I love dogs, I have no beef with any specific breed, but simply with any dog whose owner feels neither the need to neuter them nor responsibly secure them in their yard/home. I think that dog's owner mistook his pit's giant testicles for his own missing ones. For what's it's worth, this piece got me started on a longer memoir about my early years living in Normal Heights, which I blog about in a NH neighborhood blog entitled "The Abnormal Width of Normal Heights," which was the original title of this cover piece. Take a look, if you like. May 14, 2010 @ 7:58 p.m.
Cuddle, that link is the sign in page to Hotmail. Somebody email you, by any chance? Was it by any chance Cgonza? 'Cuz he emailed me. I deleted it without reading it. May 14, 2010 @ 9:59 p.m.
May 15, 2010 @ 10:26 a.m.
May 15, 2010 @ 10:34 a.m.
May 15, 2010 @ 12:35 p.m. I really enjoyed reading this article. David Adler is a talented writer and storyteller. But let's face it, folks, these stories point out just how dangerous peanuts and mariachi bands can be. Also, Hank should be on a leash. May 16, 2010 @ 6:10 p.m. The reason we hear about more pit bull attacks is because there are more pit bulls/mixes than any other breed. They make up seventy percent of all dogs in America's shelters, so there must be many, many more in homes. German Shepherds and Dobermains had the same bad rap in the 60s. They were considered dangerous dogs. Any time a breed gets popular, the breeding runs amok and then you've got agrressive dogs. The reason I chose my pit bulls, is because they had no fight in them. When they got uneasy, Nancy turned her back (avoidance...the four types of reactions are fight, flight, avoidance and submission) and Gus just doesn't care about anything but treats and having fun. I agree with Anti. That woman's kids should be taken away. She has no business risking the lives of her children just because she wants dogs. She has no common sense. One thing that makes all breeds risky is that they are good at sizing themselves up against others. If you are 60-pounds with razor sharp teeth and know it, what's to keep you from going for that yummy sandwich in that little kid's hand, even if you have to hurt him to get it? It makes perfect sense in the dog world. A chihuahua knows he can get his a$$ kicked and probably wouldn't go there. However, a few months ago, I did read a story in the paper ago a pack of chihuahuas launching an attack on someone. The shelter workers I know, tend to love the pit bull breed for their eagerness to please, but were a bit worried about my bringing them home to my other dogs. I recently sent a picture of all of us together to reassure them. None of them are status seekers and have no fight. I don't allow them to wrestle or play to hard so that fighting gene won't come to the surface. When confronted by a dog, turning your back sends a message that "I can't handle this." Turning sideways says, "come on over," and facing them says, "stay away." Keep your body language fluid. Pit bulls bite the same way and for the same reasons as anyother breed. They latch on when they wrestle and when something looks like a bull's nose. I'd try to cut off their breathing, like maybe choking them by twisting their collars, because they have a high tolerance for pain. May 16, 2010 @ 11:29 p.m.
May 18, 2010 @ 11:14 a.m.
First of all I would like to say I thought this was such a funny and enjoyable story. I think the author did an amazing job. To the people who keep posting about how this is giving pittbulls a bad name that is just bull crap!!! ITS A STORY first of all and thats not all the story was about,also hell his dog was part pittbull. anyways I LOVED IT AND LOVED HANK. KEEP UP THE GREAT WORK!!!!! May 19, 2010 @ 2:28 p.m. Pit bulls do NOT have "locking jaws". If they did, they wouldn't be dogs. And those huge monstrosities with heads like cinderblocks? Not pit bulls. The breed standard for the American Pit Bull Terrier calls for a weight for males of up to around 55 lbs. The American Staffordshire Terrier can weigh in up to around 80 lbs. Most of those "pit bulls" are mixed up with mastiffs and other breeds. If they have nasty dispositions, it's more likely to be a tendency in another breed, or just plain bad breeding.